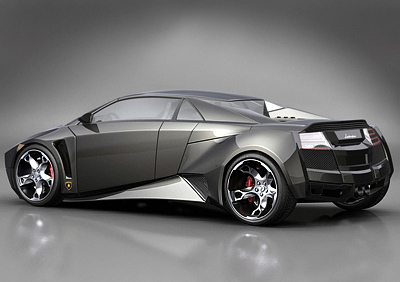 The Lamborghini Embolado concept is the creation of Luca Serafini, an Industrial Design student at the University of Parma in Italy. The Embolado concept is based on the dimensions of the Lamborghini Gallardo, which helps to give the concept some credibility. Although as the Embolado is an independent design the chances of production are zero. The name of the Lamborghini Embolado comes from a Spanish festival called the "Toro Embolado". The festival involves releasing a bull into the streets with a burning ball attached to its horns. Although now it is common for someone to carry a bull shaped framework instead of using a live bull. 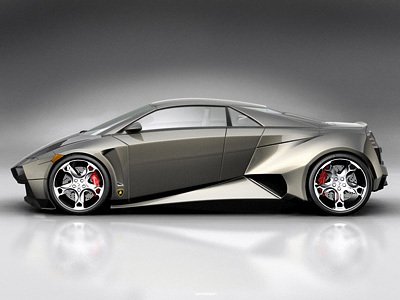 The design of the Lamborghini Embolado is characterized by aggressive lines, sharp edges and short front and rear overhangs. The dominating side air intakes just forward of the rear wheels give the car a variety of interesting shadows and highlights around the rear arches and side sills. The nose of the Embolado and the rear panel, are however slightly more difficult to define. The rear panel is cluttered, although the shapes and layout do stand out as belonging to a Lamborghini. While the nose of the Embolado looks dated when compared to the Murcielago LP640 and Gallardo front ends. But with minor changes these problems could easily be rectified.